Craft is hot right now…. 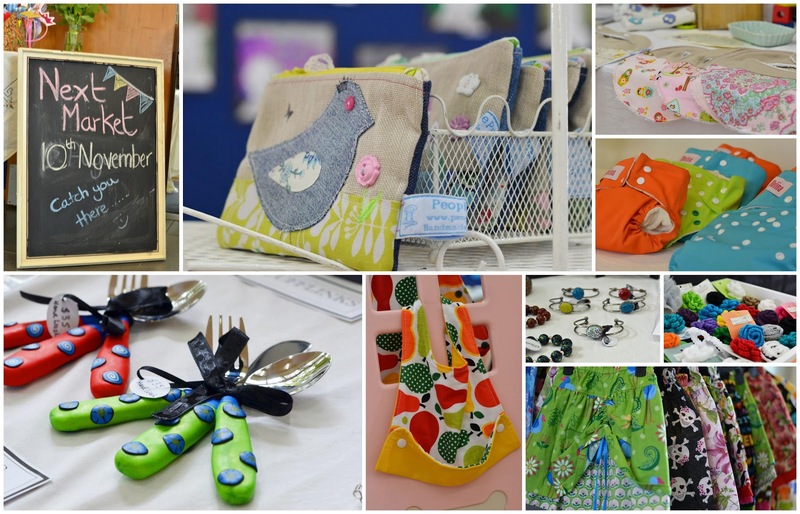 So hot, that there are craft markets popping up everywhere. We all love a good craft market and our weekends are planned to fit in a visit to some of our favourites. But how many of you know how much work it takes to organise a market? It’s not just the organisers who have a lot of work but also the stall holders, who will spend weeks creating crafts before a market. 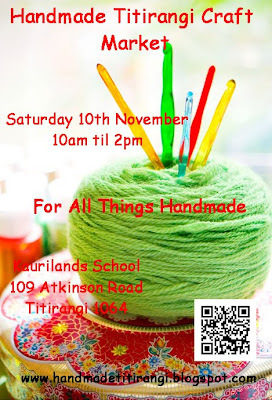 I would like to introduce you to “Handmade Titirangi Craft Market”, my little baby. Certainly one day is not the only I time spend organising a market, but it’s just the end of several weeks of work. The weeks running up to the big day are spent printing and distributing advertising, placing adverts in papers, selecting talented stall holders and so much more. Mr Handmade puts all my signs up 6 days prior to the market. So if you see a lovely man with big blue sign and a drill, that’s my hubby so make sure you hoot! So the big day has come….. My alarm usually goes off at round 5.30am. I always start the day with a good large cup of coffee and try to have breakfast, but this tends to be forgotten or left somewhere! The car has been packed the night before and tends to be a late night. My loyal Nissan is filled edge to edge with tables, chalk boards, signs, my stock (People Puppies), clothes rails, mannequins, a ladder (because I am a bit short), hall decorations, coffee machine and almost everything but the kitchen sink. There are usually a few energy drinks and some lollies; these are always needed on market day. After double and triple checking my long list, as I usually forget something, there is just time for a quick check of Facebook plus a post on the markets page. I leave my house at 7am and start heading for Kaurilands School on Atkinson Road, not too far to travel. On arriving I begin setting up outside just as it begins to get light. I have made all the decorations and signs for the market myself. The first things to go up are the market banners. These are hung between the trees and lampposts to let everyone know the market is here. The sandwich board is placed just up the road for drivers to see. Red and blue bunting is hung up outside the schools front door and the handmade banner. The hall is decorated with more red and blue bunting throughout the hall and finally I finish unloading my car. The market has around 30 stalls each month. The stall holders have the choice to hire tables or bring their own. Following my table plan I set out our tables ready for everyone to arrive. I also set up my own stall which is People Puppies. All the chalk boards are set up in the different spots around the market and have information for the customers, like when the next market is on and special giveaways. There is a special giveaway run every month for the customers. All the stall holders are asked to arrive at 8.30am. This is when the fun begins. It is so lovely to see people come back month after month. Meet and greet everyone and see how they have been. I show many of the stall holders to their spots and help out if anyone needs it. It such fun as the big empty hall becomes a bustle of activity and filled with chatter. Everyone begins by unloading their cars and setting up their tables. As a seller it is important to ensure that you products are displayed nicely for the customers. So the stalls holders begin by laying out their tablecloths and setting up their displays for their stock. There is a monthly colouring competition for the kids where they can win an art and craft prize. More entertainment for the kids include the amazing” Balloon-a-Trix” and “Face Art” our face painter too. So remember to bring the kids for some fun. While the time has flown by, it is now suddenly 10am. The customers are arriving and begin to walk around the hall looking at everyone’s products and making purchases. It is always nice to buy yourself a treat when you go to market. The smell of coffee is spreading through the hall, as the coffee orders start coming in and some hungry faces are checking out the fresh baking in the kitchen. There is even a couch were customers can sit down and relax, enjoy their coffee, baking or just read the paper, or for a mum to feed her baby. As the busy day flows on by. It is filled with chatter and coffee. It is now 2 O’clock and as the last of customer leaves the stall holders begin to pack their wares. They begin packing everything into its box and back into their cars, ready for the journey home. The hall begins to empty as everyone says their goodbyes. The big hall is suddenly empty and quiet again. Mr Handmade has arrived to help pack up the tables and load my car. The kitchen is cleaned, the and maybe a quick nibble if something yummy is left. The buntings and banners are taken down and folded away. The hall is swept and mopped so that it is ready for the church on Sunday. There’s one last look around as we don’t want to forget anything and the doors are locked. Mr Handmade is off to collect the signs and that is all untill next month….See you then. A Thank you to my fabulous Stall holders, who come each month. Thank you to Mr Handmade, Lisa (Sweet Matilda) and Alice (Absolutely Alice) for their help and support each month. Bronwyn Armstrong is an addicted sewer and designer. Wife to Anthony and the mother of 3 busy girls, Owner of People Puppies and Event manager for Handmade Titirangi Craft Market. Bronwyn has been in business for 6yrs. She is a lover of all things crafty with an addiction to op shops, sourcing vintage fabrics and upcycling the unwanted into unique clothes for kids. Great to see what happens behind the scenes thanks for sharing. Love reading things like this thanks for sharing. Very insightful - well done to all involved! Running any large event takes many layers of planning that often goes under the radar. Have only heard great things about this market.